So due to high winds this weekend I decided to clean a reel which I recently purchased from eBay. The reel is a Shimano Citica 200D in good shape.There is nothing I hate more then having issues with a reel when your only focus should be on fish when fishing. This reel is smooth so I didn’t take it apart for a complete over-haul(ill regret that later I’m sure). I used some high proof alcohol and some Q-tips to clean the exterior and some interior contact points of the reel. I focused on the spool pinion,pinion gear and spool.I also cleaned the brake case, clutch bar and worm shaft with. I removed both of the spool bearings and soaked them in alcohol. 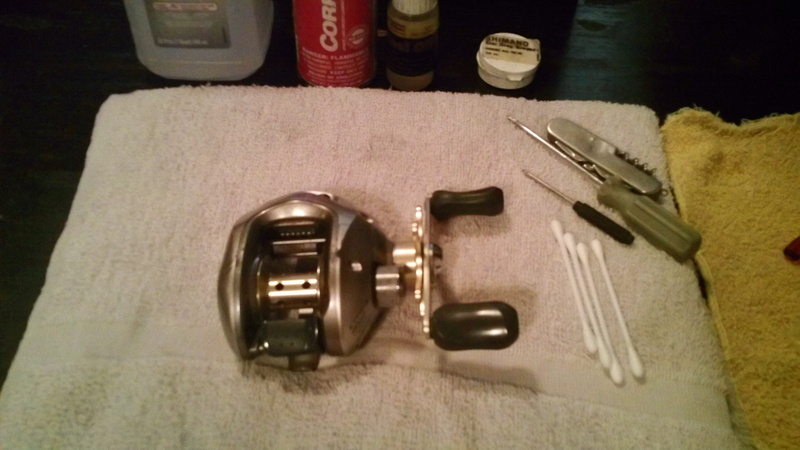 After cleaning the reel well with Q-tips I used a cloth and wiped the interior and exterior down with some Corrosion X. I made sure to use only a little amount to avoid over application. This stuff goes a long way and as long as you have a thin layer you should be fine. This is a great product to use for reel cleaning. Like the name indicates it prevents rust and also lubricates. 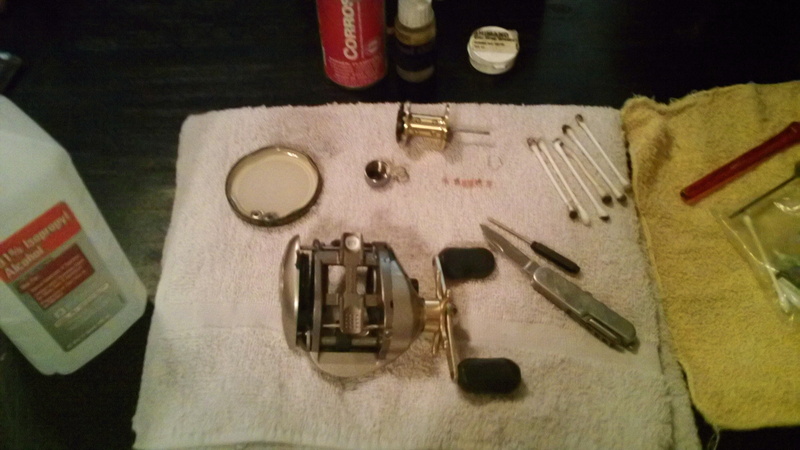 After spending sometime on my reel I pulled the bearings out of the alcohol and soaked them in reel oil. I added just 2 drops of oil to each bearing. If you add too much oil it will work against you. The oil will collect dust and particles which will impeded the free flow of the bearings. When it comes to oil sometimes less is more. I recommend BOCABEARINGS.com for bearing upgrades. They offer various bearing options at affordable prices which will improve your reels performance.They are easy to install and if you have an older reel new bearings are cheaper than a new reel. I put the bearings back into the reel,assembled it together and gave it a fast crank to check its action. By doing just a superficial cleaning I was able to increase my free spool time and the longevity of my reel. I recommend to clean your reels at least once a month if you fish alot. It is important that if you dunk your reel in saltwater that you clean it ASAP. Not doing so will result in you buying a new reel and were not all made of money. Soaking bearing in alcohol and cleaning spool. Remember at the very least rinse off all your reels with some sort of reel cleaning solution or use warm water with very very little soap. Always rinse your reels and never spray them down. By spraying you actually help to embed the particles in your reel which equals a crunchy,un-smooth reel.